Izzy Eats: The art of raising a gourmand, one bite at a time: A Second Grade Syrup Tasting: Maple or Aunt Jemima? A Second Grade Syrup Tasting: Maple or Aunt Jemima? Which one was the winner? In honor of maple syrup season, she paid a visit to her daughter S.'s 2nd grade class to read a story about how maple syrup is made and then conduct a taste test, to see which syrup the children preferred, pitting real maple syrup against Aunt Jemima. She brought in two unmarked bottles of "syrup" and had each child taste a spoonful of each. Out of 20 students, the disheartening news is that 17 preferred Aunt Jemima over the real maple syrup. They were instantly able to recognize it as the syrup they ate at home and showed a clear preference for it. I did not find this especially surprising, simply disheartening. After the test, L. explained to the young students that Aunt Jemima did not even have anything maple in it and then she explained why maple syrup was healthier, encouraging them to consider eating the real thing. Even if they don't, at least they have been exposed to it. What I had to wonder was why so many children were eating Aunt Jemima rather than real maple syrup, particularly in an upper middle class neighborhood where cost might not be a major issue? If fake syrup reigns supreme, clearly the advertisements maligning high fructose corn syrup have failed. Given another demographic, I might entertain the argument that cost was a factor but then in defense of using real maple syrup I would suggest that a little goes a long way and you needn't douse your pancakes or waffles in it but rather drizzle it sparingly on top. Once again, more evidence to support my mantra "Eat what you love and your children will follow." What they eat is up to you. P.S. I would love to poll these children years from now as to their syrup preferences. There is certainly hope since I was raised on Aunt Jemima myself and haven't touched the stuff since I started buying my own food. When i read the title, i thought that the taste test would be which 'grade' of syrup one prefers, Fancy, A, or B.
A.J. shouldn't even be a consideration. I wonder if their parents were raise on A.J. and passed the tradition down. Wasn't it one of those food developments that occurred around the same time as Betty Crocker, to the point where two generations are comforted by the taste of cake-in-a-box and thank the baker and her/his hard work profusely? I have to agree with the comfort food aspect. Regardless of cost or socioeconomic status, people - even if they know better - often eat that which makes them feel good. I was raised in a home where anything frozen or that came out of a can was shunned. Consequently, with some measure of deviation, I am most comfortable eating what is considered "good" or "real". 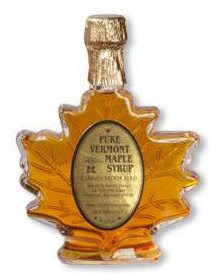 I also agree that any syrup not created in VT, ME or Canada should ever be considered. Why don't you have them taste test 2 high grade versions of the genuine article and see what happens? You could even mess with them and pour the good stuff out of A.J. or Mrs. Butterworth's bottles. The visual identification aspect seems as interesting as the actual contents to me. Idtarod: In an ideal world, A.J. would not be a consideration. Unfortunately, we live in the land of hfcs! Bean's Mum: The class was an ethnic mix so my guess is some may have and others may not have been raised on syrup at all but A.J. is just so "all-American" people just buy it..
Ethan: Oh absolutely, it is all about comfort food. But it would be so easy for parents to substitute the real stuff and change their tastes. Love your sneaky ideas but we can't use the same kids for experimentation! L.: You will have to experiment with next year's class using Ethan's idea! When I was a kid, my dad always bought real maple syrup. I always hated it. To this day, I still prefer the corn-syrup products, which is horrible, I know. I love maple in other things, just not on my french toast. My mom's family is from TN, and it's really common for people to use straight Karo syrup on biscuits, pancakes, etc. My dad still tries to push real maple, but it's one natural food I can't deal with on my french toast, lol.